PennsylvAsia: Tarentum dermatology office with Japanese garden among "Pittsburgh's Coolest Offices." Tarentum dermatology office with Japanese garden among "Pittsburgh's Coolest Offices." The Pittsburgh Business Times features Tarentum's Rabkin Dermatopathology Laboratory PC in this week's "Pittsburgh's Coolest Offices" section. The lab is surrounded by a rose garden, a traditional Japanese garden with a tea house and koi ponds, and a Zen Dry Garden. The windows overlook these gardens and the green hills of the Allegheny River Valley. The dry garden has mossy islands surrounded by a sea of raked gravel, a wisteria pergola to stroll through and to sit in the shade, and a bamboo grove with a small fountain providing the sound of falling water. 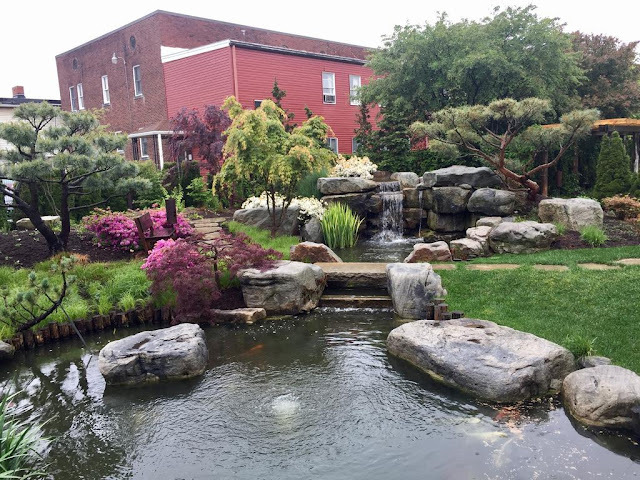 The stroll garden has a koi pond at its center and an open viewing pavilion and outdoor office. It is encircled by a path that weaves through groves of trees and out onto the lawn. A rustic stucco wall screens the garden spaces from a parking lot and creates an oasis in an urban setting. The planting within each of these areas were designed to provide contrast in textures and forms for a rich visual experience and seasonal display. 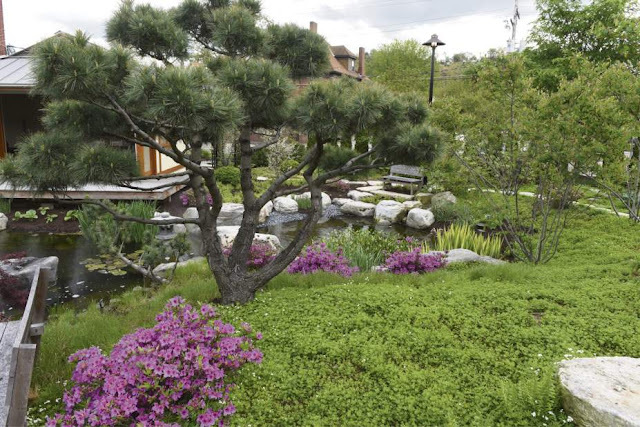 The garden includes stonework and water features built by Jim Lampl and traditional Japanese woodworks by Tadao Arimoto. Doug Oster wrote a lengthy piece on the garden for the Tribune-Review in 2016. By Doug Oster, Pittsburgh Tribune-Review.